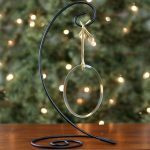 We just added some new Christmas Memorial Ornaments to our website. These are our exclusive designs designed with our customers in mind. We sold out of last year’s version rather quickly, so I encourage you to consider purchasing sooner rather than later. 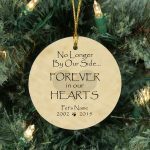 Remembering our loved ones during the holiday season often brings such comfort to so many of us who are grieving this Christmas. What I love about Christmas Memorial Ornaments is that they can be given year round. 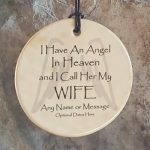 With our popular Memorial Ornaments stand, these ornaments can be displayed on a bedside table, coffee table, or anywhere to remember your loved one. I HAVE A GUARDIAN ANGEL IN HEAVEN AND I CALL HIM/HER.. These beautiful Memorial Ornaments say “I have a Guardian Angel in Heaven and I call (him/her) Dad, Mom, Wife, Husband, Son, Daughter, Specific Name – the options are endless. The can be customized with any name or message and a date if you so desire. The Christmas Memorial Ornament says it all. Simply stated, “In Our Hearts Forever”. 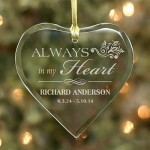 This ornament can be customized with your loved one’s name as well as the birthdate and at rest date. Also shaped in a teardrop, this is simply beautiful! If you would like another name, please contact us with your request. This is a ceramic ornament and is just beautiful. One of our favorite Memorial Christmas Ornaments. We are hoping you will find peace this Christmas holiday season with fond memories of your loved ones.